The advantages of the lateral approach include the following: (1) the procedure is not affected by the shape of the sacrococcygeal area; (2) the needle is inserted laterally to the sacrum to allow the needle tip to reach the midline easily; and (3) high-frequency thermocoagulation is not associated with complications such as neuritis and can be safely used in patients with nonneoplastic pain. Needle insertion from the right side is safer because it protects the sigmoid colon unless the patient has had total pelvic exenteration. We perform mandatory pelvic MRI before each nerve block to further ensure the patient’s safety. Although further evaluation is necessary, none of our patients have had complications after thermocoagulation at 90°C. 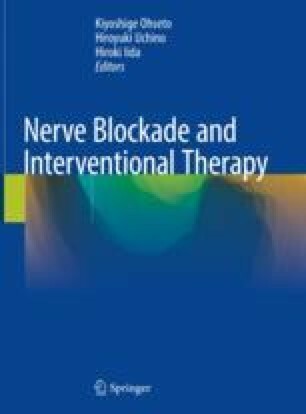 We described the ganglion impar block (high-frequency thermocoagulation) using a right lateral approach.